We are located in Lee, New Hampshire, halfway between Boston, MA, and Portland, ME, about 20 miles inland from the seacoast. The nearest town is Durham, home of the ﻿University﻿ of New Hampshire. 45 High Road, Lee, NH, 03861. From the South: Drive North on I-95. Take Exit 2 (Exeter/Hampton), and go west on Route 101. After about 12 miles, take Exit 7 in Epping. Go north on Route 125 for about 5 miles. At the stop light at the intersection with Route 152, turn left onto Route 152 West (towards Nottingham). Take the next left (100 feet) onto High Road. Take your first left into Bedrock Gardens parking area. Town ordinances prohibit parking on the street. GPS Alert! As you go north on Route 125, some GPS systems are advising turning left on the North River Road 1-2 miles before you get to Route 152. This will give you dirt roads and a longer trip. 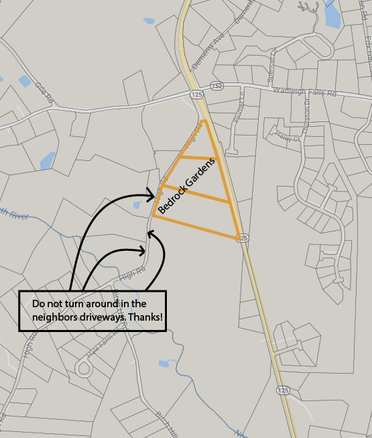 Better, however, to continue past North River Road to Route 152, and turn left there as above. From the North: Exit Route I-95 onto Route 4 (Spaulding turnpike). Follow Route 4 west. Don't miss the exit from the Spaulding turnpike onto Route 4 in about 4 miles. Go another 10 miles through Durham towards Concord. At the Lee Traffic Circle, turn left (South) onto Route 125. Go south on Route 125 for about 5 miles. At the stop light at the intersection with Route 152, turn right onto Route 152 West (towards Nottingham). Take the next left (100 feet) onto High Road. Take your first left into Bedrock Gardens parking area. Town ordinances prohibit parking on the street. From the West: Go East on Route 101. Take Exit 7 in Epping and go north on Route 125 for about 5 miles. At the stop light at the intersection with Route 152, turn left onto Route 152 West (towards Nottingham.) Take the next left (100 feet) onto High Road. Take your first left into Bedrock Gardens parking area. Town ordinances prohibit parking on the street. GPS Alert! As you go north on Route 125, some GPS systems are advising turning left on the North River Road 1-2 miles before you get to Route 152. This will give you dirt roads and a longer trip. Better, however, to continue past North River Road to Route 152. Another GPS alert: Google is sometime calling High Rd by another name, Towle Rd. Then you have to search for 45 Towle Rd in Lee. 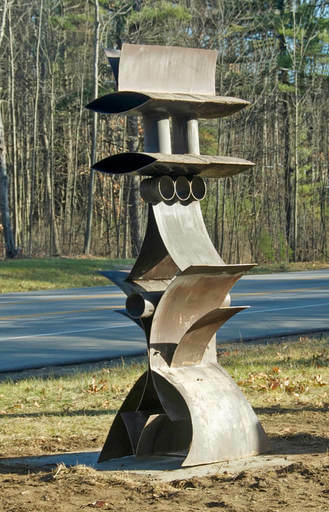 Tip: This sculpture is at the intersection of Rtes. 125 and 152...and High Road! Keep the sculpture on your left. As you go down High Rd past this sculpture, we are the FIRST driveway on the left. If we are closed, there will be a sign there, and you can turn around there, and go back. Also, ​Please don't turn around in the neighbor's driveways.